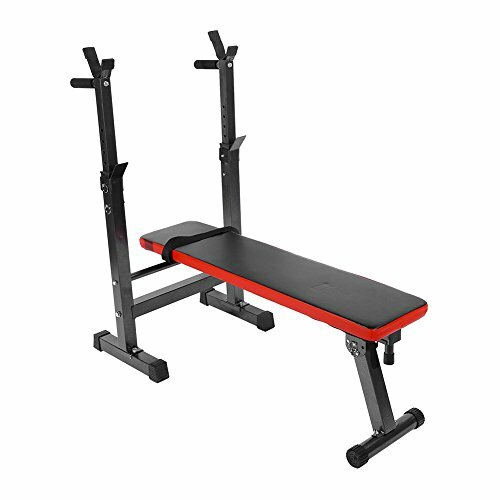 Bench Dimension:43.3" x 21.7" x 16.5"
Laying Surface Size:43.3" x 9.4"
Height of Barbell Rest: 3 settings:32.7", 34.6",36.6"
High-quality PU Leather Surface:Built-in high intensity composite board,high-quality PU leather surface,waterproof,sweatproof,antiskid and abrasion resistance. Safe Bolt:The perfect combination of engineering design and screw.Safe bolt plays a role of second protection. Sponge Handle: The handle is made from sponge which makes it easier for you to get the energy when working out,better to protect your arms. Safe and comfortable. Antiskid Footstand:The pedestal of weight bench is equipped with round antiskid footstand which increases the stability of main branch support to prevent shaking.